Cool concept but a tad bit repetitive as others have said. I think there are a lot of places this base could be taken if it were to be fleshed out! Really cool idea with tense gameplay. I think a little polish and variety could turn into into a great game! This is a really cool concept. I can see where you were going with it, it's unfortunate that it's a bit buggy but it'll be a really good game when you are done with it. Be proud that this was made in a new engine in only 2 days, you didn't make it easy on yourself choosing pico-8. Yeah, I'm really bummed that it shipped with two pretty big bugs (tower 2 and 3 not upgradable, upgrades past level 7 result in crash). I did post a version with bug fixes (but no new content or improvements, to stick with the spirit of the jam). Without the additional mechanics I had planned to implement, it is a bit repetitive though. I think this is a neat concept! The fact that it's so repetetive is almost like, part of the meta-humor of choosing what you did based on the restrictions Mark Brown set. It reminds me a bit of Pikmin 3, where you alternate between squad leaders. It would be nice if there was a bit more to do than just move balls and shoot, but for a 48 hr concept this is really a great showing. It would be cool for your game to take some cues from those. Like imagine if yours was local co-op, like lovers? or if there was a bunch of "spinning plates" to maintain with limited resources. I enjoyed the game until it crashed after I upgraded the first tower to level 8. I think the game could do with some music and sounds, because with nothing but silence it gets a bit repetitive after a while. I was only able to upgrade the first tower so my strategy consisted of mainly just supplying ammo in a loot and then finishing any survivors with the last tower. I think it could do with more things to do, but still I had an enjoyable playing experience. Thanks for the reply. The upgrade system was the last thing I was doing and it came down to the wire, so the jam version has 2 big bugs shipped. One is that only tower one is upgradable and second is that upgrading past level 7 causes a crash. There is a link to a version with bug fixes, but no new features (to stay in the spirit of the jam), in the description, if you would like to try that. This is actually a very good concept, albeit a little bit repetitive. Maybe try changing the position of the ball disposer every few balls taken? Apart from that, I like the Atari aesthetic you were going on with the site. Keep up the good work! I was thinking that for making it less repetitive he could make upgrading to different types of towers a thing instead of just upgrading speed and damage. This would make it much more interesting and drive the player to keep trying so they can see what the different typed of towers they can unlock are. These towers could also have much different ways of firing. This game could really be taken quite far. I hope he continues to work with it! I definitely wanted to add more to the game, but started running out of time. I barely got the upgrade system in place. 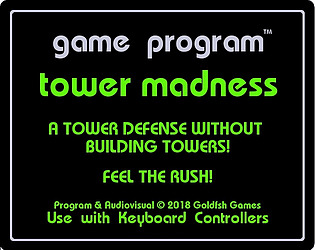 I had planned on making a few more activities, like repairing the tower, fighting enemies inside the tower, full upgrade menu with different upgrade types, changing ammo locations (some one runs in to the tower and drops of ammo in different locations each time). I'll pursue this idea for sure, so stay tuned! Thanks! 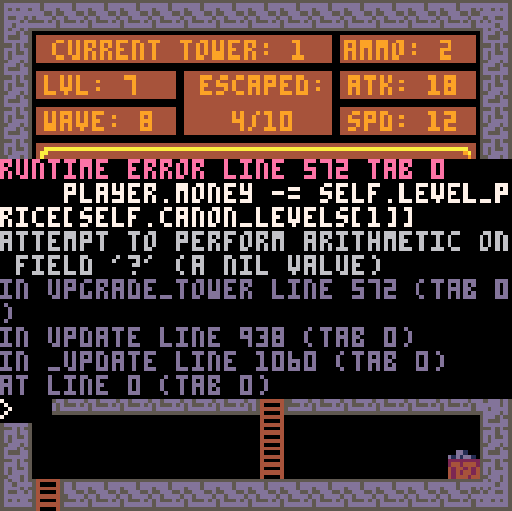 As for the towers, upgrade mechanics were the last thing I wrapped up with about 1 hr til deadline, so I finished the mechanic, but forgot to copy functionality to tower 2/3. I'll update the game on here once the jam wraps up with bug fixes and sound. Also, I forgot to hard limit the upgrades before submitting, so once upgrade reaches level 10, there is no more data in the tables to update atk/spd/cost, ect. Very interesting! The engine limitation worked very well with this game. I was unable to upgrade the towers, unsure if it was a bug or if I didn't understand it correctly. Would like to see how future levels would develop! I love the split screen gameplay on such a screen.